Inside the reactor a fuel bundle glows with a vibrant blue light known as Cerenkov radiation, produced as escaping neutrons are slowed by water. Southern California Edison spokesman Gil Alexander said Thursday that worker at San Onofre Nuclear Generating Station fell inside the plant’s Unit 2 reactor pool last week. The worker is employed by a private contractor assigned to replace the reactor’s vessel head, “momentarily lost his balance” and fell into the pool Jan. 27 while leaning over to retrieve a flashlight. 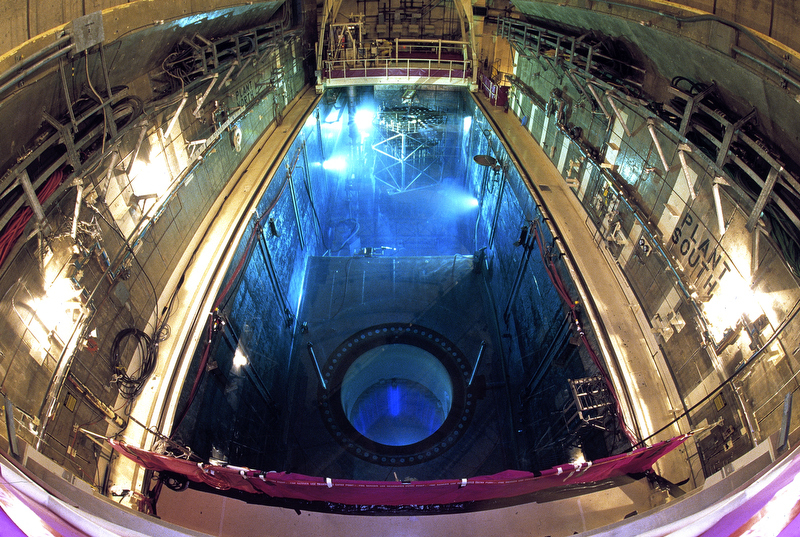 The pool is more than 20 feet deep and holds water that continually circulates through the reactor core. “The worker was able to return to work the same day,” Alexander said. Edison will revisit its procedures for working around the reactor pool and may require that workers tie off with ropes to a surrounding structure as a way of preventing another incident.